The Body Shop Camomile Cleansing Butter | £12 // I have both the chamomile cleansing butter and oil and I prefer the latter. While the cleansing butter works just as well as the oil, it’s the oil that lasts longer and is therefore cheaper in the long run plus you get 10ml more product and £2 cheaper. I take a small amount of the cleansing butter and massage it onto dry skin until it turns into an oil. I then take a damp flannel or muslin cloth and buff it off. I do have to make sure I thoroughly remove this though as it does leave a residue behind on the skin which clogs up my pores and irritates my skin. I tend to use this when I want to double cleanse so I use this first and then I follow up with another cleanser which is a bit more skin friendly. I'm glad I've tried it and I've enjoyed using it but I don't think I'd repurchase although I would recommend it. The reason I wouldn't repurchase is because it contains synthetic fragrance which you'll see as a theme across this post. I need to get better at reading ingredient lists before making future purchases! The Body Shop Vitamin E Overnight Serum-In-Oil | £13 // I bought this as soon as it was released and everyone started raving about it as there was a 50% off discount code for TBS. Ever since I have had buyers remorse over it though as I should have read the ingredients list and/or went to try it out in-store before buying it. Had I done this then I probably would have saved my money and not bought it. Luckily I never bought it full price but I could have spent the £6 on something else. The main thing that puts me off this serum-oil hybrid is the strong fragrance. I have used and still am using products containing synthetic fragrance, although I am slowly stopping this, and haven't had a problem with them despite my sensitive skin. This is so strong and overpowering that I was quite apprehensive about using it.Just look at the ingredients list and you'll see so fragrance ingredient in a lot of brackets. This isn't really a proper review as to be honest, I haven't given it a good enough trial and I'm not even sure if I will. It's more of a be warned if you have sensitive skin and know synthetic fragrance irritates your skin as you might not want to try this. 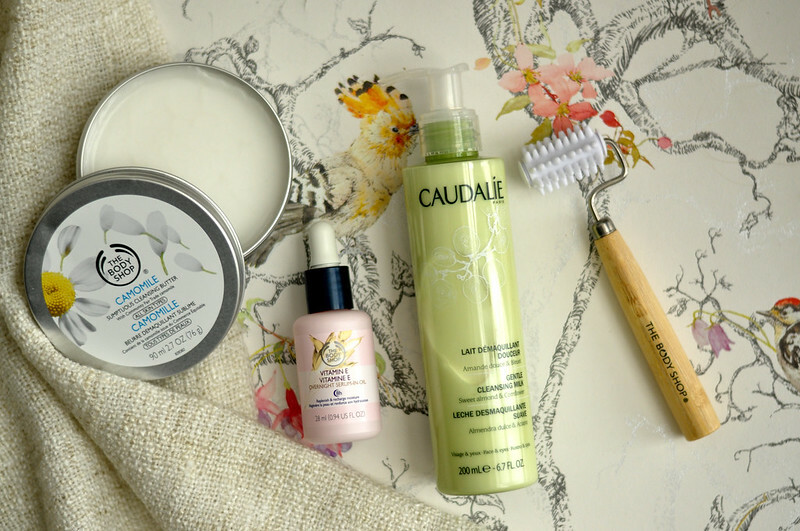 Caudalie Gentle Cleansing Milk | £15 // I have very sensitive skin which goes quite red and irritated very easily so I prefer to use cleansing milks as part of my morning skin care routine. They’re easier to remove, either by splashing off or with a muslin cloth, than balms and they don’t contain the foaming element of a cleansing gel which I find makes a difference to how red my skin gets. I also find this one from Caudalie in particular to be quite moisturising. The name is really true, this is a very gentle cleansing milk. Since I’m not using this to remove make-up, simply to wash away the night, I find I don’t even need a full pumps worth of product. I apply this to dry skin and massage it in before adding a splash of water to emulsify the cleansing which I then massage in for a bit longer before removing with a damp muslin cloth. Once it is removed my skin feels incredibly soft and clean but without feeling tight or that it’s been stripped of all the natural oils. Over all, it’s a wonderful cleanser that I enjoy using on a daily basis and I really like the packaging. The only downside is that it contains fragrance. Although I am washing this away and it isn't sinking into my skin I eventually want to avoid using synthetic fragrances in every product I use. The Body Shop Facial Massager | £6 // It was Caroline Hirons who made me want to try this facial massager. It's surprising how relaxing it can be to use and I've enjoyed adding this into my nightly routine. A quick facial massage before bed and I feel like I'm able to switch off better before bed and get a good nights sleep. This helps to get rid of those horrible cystic spots that never seem to come to a head and are incredibly painful, especially around the jaw line. It also helps to increase circulation and will help with keeping skin tight in the long run. I have very sensitive skin and this doesn't irritate it or feel like it's dragging or pulling my skin. Of course you have to be somewhat gentle when using it anyway, but don't worry if you have skin like mine. I like the look of that facial massager! Oh! The facial massager sounds dreamy! I have some sort of massager with teeny tiny needle which is meant to boost collagen production, but this is a) not exactly relaxing and b) kind of scary and painful. I'm definitely gonna grab the Body Shop one next time I'm in there, thanks! I use the facial massager too (because of Carolines recommendation of course!) when I actual remember to use it it really does make a difference! I've also gone through the whole tub of the cleansing butter, I also use it as a first cleanse just to remove makeup really! I much prefer it to the oil though, the oil's too messy for me!